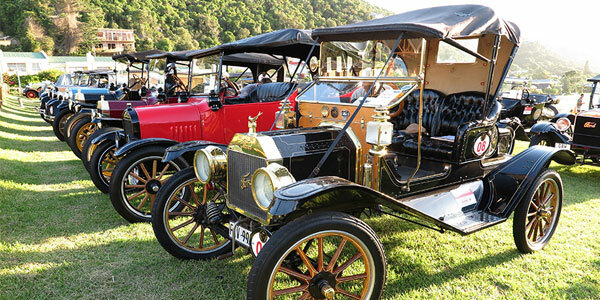 The biggest Ford Veteran and Vintage Tour of the past 35 years took place at the George Old Car Show where fifty-two vehicles, comprising of no less than 38 Ford models took part in the event. The four day event was full of excitement with active participation of the Veterans with their favorite cars. Model T/Ford and Veedol motor oil together started their journey, way back in 1914 with the introduction of Model T, when Legend Henry Ford chose Veedol as his first motor oil in 1914 for worlds first mass produced car. Veedol with their partner in South Africa have actively supported the event. Day One, Ford Day- the participants were greeted by sunny skies as they left the Wilderness Hotel and hit the road through the seven passes route to George. They filled their fuel tanks for free at Atlantic Fuel Station sponsored by Samuels Service Centre then hit the R102 through the old part of George to Mossel Bay. Afternoon, they took to the road again into the beautiful Klein Karoo. Everyone arrived at the Oudtshoorn Holiday Inn a little sunburnt, but that did not dampen the spirits of the participants. Day Two, Veedol Oil & Samuels Service Centre Day began with an early morning drive through the town of Oudtshoorn, heading west towards Ladysmith on the R62. After tea in Zoar, they took the pass-through to Seweweekspoort. Day Three, The Outeniqua Lab and MUA Insurance Day kicked off with an early morning drive through the Cango Caves 80 km north on the R407 through the windy roads near the tobacco and onion farmlands of the Klein Karoo. Participants then stopped at the Buffelsdrift Game Lodge for lunch and were allowed to take the Model T Fords through the park surrounded by some of the Big 5. In the evening they enjoyed a gala dinner with “The Golden Era of the Ostrich Industry” as the theme. Participants dressed up in evening attire from the early twenties (when ostrich feathers were more expensive than gold). On Day 4, The SAClassics.com Day – The group left Oudtshoorn on the final day and drove to the waterfall in Meiringspoort and then to PW Botha College for the George Car show being held over the weekend.